The wonderful thing about being a presenter and entertainer is that there are always opportunities to improve and refine what you do. Since we created our new business a year ago, my business partner, Velia Amarasingham and I have been delivering presentations for the leading Destination Management Companies in San Francisco. We have designed a very engaging, fun and interactive program that includes singing, dance, comedy, magic and now we've added an excerpt from our 1940s Suspense Radio Drama, where our audience gets to make the Foley sounds! 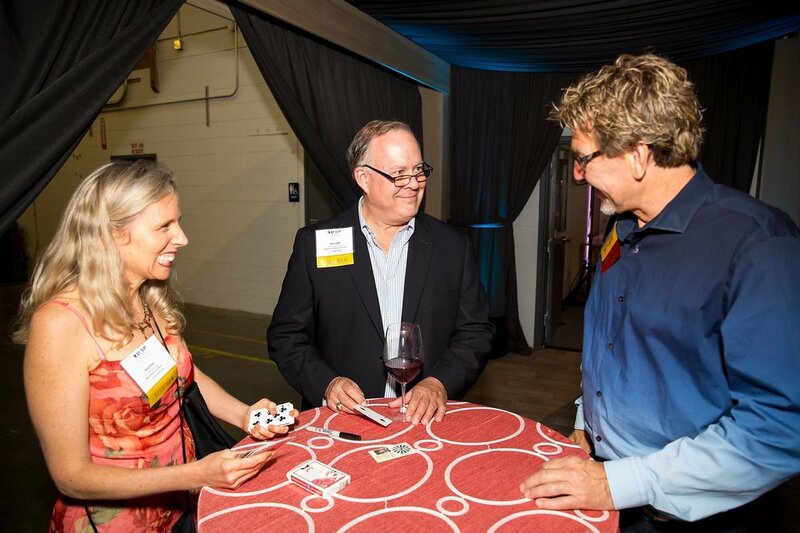 At SF Travel’s PBX Mixer that eveningI performed lots of Magic debuting my "Signed card to Altoids tin". I also performed Mentalism and a powerful card effect which is in the genre of “Any Card At Any Number”. This means a guest names any card and any number and their card is at that position. To Magicians, this is considered the “Grail” of magic. A highlight was meeting the folks at SnapFiesta who took this fun shot of Velia and I rocking out! Velia writes original songs for every client and along with our Composer and Sound Designer, Simon Amarasingham, creates entire soundscapes for events.